Limited Time Only Up To $2,000 Off 1st Months Rent! | *Applicable to new residents only. Call for Pricing 1198 SQ. FT. Call for Pricing 1249 SQ. FT. Call for Pricing 1293 SQ. FT. Call for Pricing 2047 SQ. FT. Call for Pricing 2142 SQ. FT. Call for Pricing 1805 SQ. FT. Call for Pricing 2092 SQ. FT. Call for Pricing 2292 SQ. FT. Call for Pricing 1632 SQ. FT. Dogs and cats 35 lbs. or less. No exotic pets. $500 pet fee for one pet and $800 pet fee for two pets. Yes, provided you have fulfilled your lease agreement and left your apartment in good condition. Yes, however you must give us 60 days written notice and pay a termination fee equal to one month's rent. Call or e-mail the leasing office. Rent is due on the 1st of each month. Yes, visit http://rentpayment.com for details. Yes, there is a rent drop box in the lobby. Per the lease agreement they are allowed to stay for two weeks. Parking is unreserved, however you may reserve parking for a monthly fee. Just like an automobile, in a parking spot. As long as it is not attached to the building. Comcast is the cable provider and is at the residents' expense. Yes, at our front desk. Do you have a list of companies in the Corporate Advantage Program? Yes, please contact the leasing office. When I have a guest, where do they park? We have complimentary valet parking for guests. Are dogs allowed in the 6th floor recreation deck where the pool and tennis courts are? No, dogs are not allowed on the 6th floor recreation deck. How tall are your ceilings? Our ceilings are 8 ft. tall in most of our units and 13 ft. tall in our penthouses and first floor units. Do you have a concierge? Yes, we have a concierge onsite that will help you with reservations and questions about the area. Can the water taxi pick us up at the Harbor? Yes, the water taxi can pick up residents at the Harbor near the marina office. Please contact them first 954-467-6677. What is your walk score? We have a walk score of 82. Yes, we have a business center for resident use. It has two computers and one printer. We have free WiFi in our common areas. How do I put in a maintenance request? The most common and preferred method is to call the leasing office. What direction does my satellite dish need to face? Your satellite dish needs to face south west to get good reception. Do you have a 24 Hour Fitness Center? Yes, our fitness center is open 24 hours a day and is located in the south building. How far is Sunrise Harbor from the beach? Approximately half a mile away. When can we reserve elevators for furniture delivery? Monday - Friday with the time slots of 9am - 12pm, 12pm - 3pm, and 3pm - 6pm. Availability is first come - first serve basis. Is this a controlled access property? Yes, this is a controlled access property. Does Sunrise Harbor have covered parking? Yes, residents can park on floors 2-5 in our parking garage. 1st floor parking is for retail spaces only. Monday - Friday: 9am - 6pm. Are there guest suites available? Yes, there are guest suites available only for resident's guests. Please see our concierge for details. What are the hours for the tennis courts? Hours for our tennis courts are from 8am-10pm. Cats and dogs up to 35 pounds permitted. Non-refundable pet fee of $500. for the first animal plus $300 for each additional animal. DIRECTIONS: From I-95, exit east on Sunrise Boulevard follow to Seminole Drive (NE 26th Ave) and take a left. We are on the corner of Sunrise and Seminole Drive. Call 911 if it requires immediate assistance. Call 954-667-6700 for non-emergency issues. Just a bridge away from the ocean... And a lifetime away from the ordinary! Sunrise Harbor puts the best of Fort Lauderdale right outside your door. 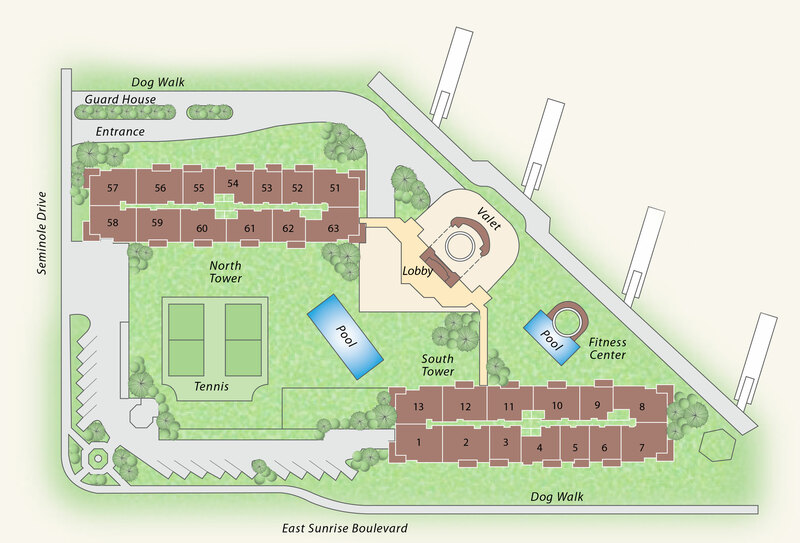 Our apartments are just on the edge of the beautiful Coral and Sunrise Bay areas and only minutes away from the shore. From the relaxing beaches to the incredible variety of shops and restaurants, you will love coming home to our prestigious community. Find serenity in our opulent spaces, tasteful architecture, lavish finishes, and charming amenities. As for your desires, simply ask our valet, concierge, or 24-hour attended lobby personnel to accommodate you. Come home to our luxury apartments - perfectly located in the attractive Coral Ridge area of Fort Lauderdale. Wake up to the robust aroma of coffee on your private balcony, giving you breathtaking views of the bay. Invite friends over for an afternoon social function at our welcoming clubhouse. Head out for a colorful South Florida evening via water taxi. When it's time to call it a night, retire to your comfortable one, two, or three bedroom home at the best apartments in Fort Lauderdale, Sunrise Harbor.